A new guide aims to help design professionals, contractors, building owners and concrete product manufacturers in the repair of concrete buildings. 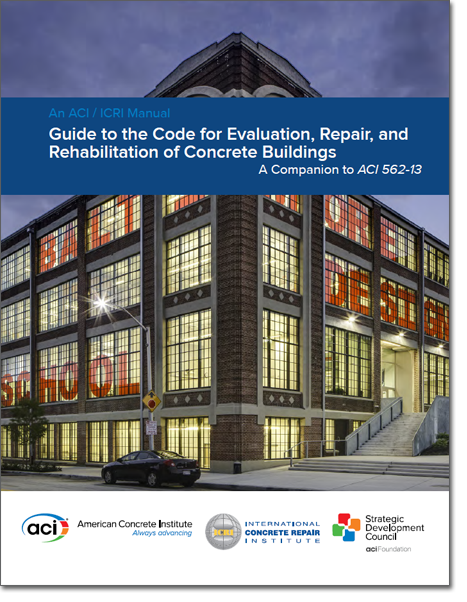 Billed as an “invaluable” tool for concrete professionals, The Guide to the Code for Evaluation, Repair, and Rehabilitation of Concrete Buildings has been published jointly by the American Concrete Institute and the International Concrete Repair Institute. The new manual serves as a companion to ACI 562-13 Code Requirements for Evaluation, Repair and Rehabilitation of Concrete Buildings, the ACI’s first model code for the repair of existing structural-concrete buildings. The code was published in 2013 and an update is in the works. The guide follows the organization of the model code and offers examples of repair projects. “The primary purpose of this Guide is to help licensed design professionals gain more knowledge, skill, and judgment to interpret and properly use ACI 562,” the ACI said, noting that the tool would also provide insight to others in the industry. The publication is split into two main sections: Chapter Guides and Project Examples. These two components work together to provide additional information pertaining to how to interpret the performance requirements in ACI 562 and how the requirements may be applied to a broad range of projects, ACI explains. The Chapter Guides include information on several topics related to use of the code including preliminary evaluations to determine a compliance method for meeting the code requirements; strength reduction factors and load combinations both during and after the repair; considerations for design of structural repairs; and durability requirements. The guide’s Project Examples illustrate the use of the code for concrete building repair, rehabilitation, or strengthening projects from inception through completion. Strengthening of double-tee stems for shear.